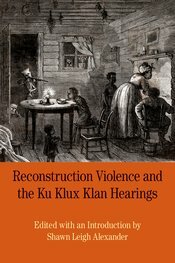 This carefully edited selection of testimony from the Ku Klux Klan hearings reveals what is often left out of the discussion of Reconstruction—the central role of violence in shaping its course. The Introduction places the hearings in historical context and draws connections between slavery and post-Emancipation violence. The documents evidence the varieties of violence leveled at freedmen and Republicans, from attacks hinging on land and the franchise to sexual violence and the targeting of black institutions. Document headnotes, a chronology, questions to consider, and a bibliography enrich students’ understanding of the role of violence in the history of Reconstruction. An outstanding contribution to the pedagogy in American, African American, and Southern history and studies.